play their first London performance of 1977 tonight, and it's at the Notre Dame Halls attached to the Roman Catholic church, just off Leicester Square in Central London. It was a last minute gig hastily put together for the benefit of the travelling NBC film crew who shot it for a US documentary on the current punk scourge. For an unpublicised gig by around 5.30 hundreds of fans were queing up outside. Eventually only 150 get in including Sid'snew bird Nancy Spungeon, TV Smith, Gaye Advert and Dave Vanian of The Damned. 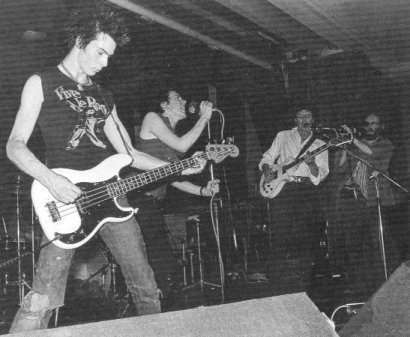 It was Sid's live debut as they played an 11 song set including 'God Save The Queen'.